Come and enjoy SOYA’s 200hr Extended Prince George, BC. The extended program is an excellent choice for those who cannot get away for an immersion. The program gives you time to learn more gradually and put the studies into practice before the next session. SOYA’s curriculum will help you excel at your yoga teacher career and your yoga lifestyle. Location: The Friendship Centre, 1600 3rd Ave, Prince George, BC. Enjoy studying in a small group atmosphere in this sacred space in downtown Prince George. A non-refundable deposit of $650 + gst ($682.50) deposit is required upon registration. All fees are paid to SOYA. Payment plans are available upon request. Fees include your teacher training manual, textbooks, supplies, and online Anatomy training with Martin Kirk ($300US value). Training Times: Weekend meetings twice a month, from 7:30am to 6:30pm. Dates are March 1-3/16-17/30-31, April 13-14/27/28, May 11-12/25-26, June 8-9. To learn more about this program review the curriculum, or to register click the link below. Cindy started practicing yoga in 2002, and it was “love at first sight” practice. She completed the SOYA 500 hour Yoga Teacher Training program and excelled in her studies. She now owns and operates Intuit Yoga in Mackenzie, BC. Cindy continued her study with Susi Hately of Functional Synergy providing her deeper knowledge in how to offer students with limitations a safe, comfortable approach to asana. Cindy has indepth training in the chakras and subtle anatomy with Anodea Judith. She leads international yoga retreats annually. Cindy loves the creative flow of vinyasa, the quiet release of yin, and the meditative quality of mindfulness. Cindy is a Lead Trainer for SOYA’s 200 hour and 300 hour advanced YTT programs in Prince George, BC. Emma began her yoga practice in 2011, after walking across the street from her workplace to Chinook Yoga, with a desire to de-stress and unwind. She quickly learned that there is much more to yoga than a good stretch, discovering the many different formats, aspects, teachers and styles, and she was hooked! She completed her 200 hour SOYA teacher training in 2012, and shortly after that her SOYA 300 hour upgrade. 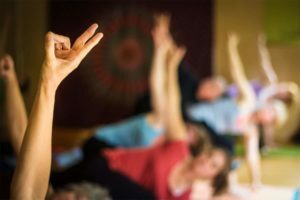 Her favourite classes to teach are based on foundational hatha yoga formats, and she enjoys teaching students who are new to yoga, who are senior, who are coming to class with physical limitations, or who are coping with mental health issues. “Yoga is such a powerful healing tool for all of us!” Emma is a Lead Trainer for SOYA’s 200 hour and 300 hour upgrade YTT in Prince George, BC.